I have a hundred or so, (some still in plastic ) metal state trays. Some are used from a collection with light scratches and wear on the back sides, but the front being perfect. 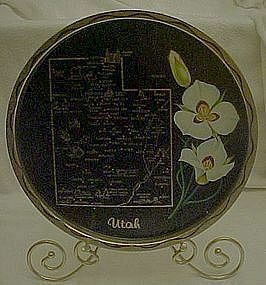 These are 11" black metal state trays with almost every state. There is a picture of the state flower, a map of the state showing many of the cities and some of the key landmarks, and some have the state bird. They trays are in average/good to excellent condition with some still in their plastic. A very nice souvenir. What state do you need? Texas? Kentucky? California? Georgia? Email me with the state you need, I probably have it, even though I may not have it listed here.